You’ve spotted something lurking in the corner of the room. It’s brown and it’s shaped like a misplaced piece of pasta from last nights dinner, what could it be? 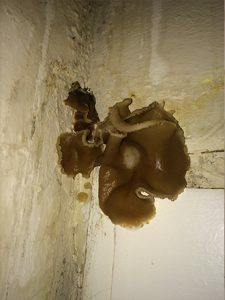 To the untrained eye, the notorious dreaded dry rot may spring to mind, but any surveyor worth their salt will be able to tell you that such characteristics belong to the elf cup fungus otherwise known as Peziza domiciliana. ‘Domiciliana’ means ‘around the house’ so it will come as no surprise that the fungus is commonly found in water damaged properties. 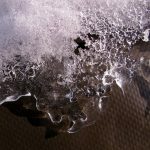 It can be located in a wide range of habitats including; carpets, living areas, behind refrigerators, under flooring and even cars; but you will most likely find it in severely damp areas such as your bathroom or basement. How Can I Spot Elf Cup Fungus? When young, the fungi will appear circular in outline and cup-shaped, sometimes with a tiny stem. Brown, yellow or even whitish. The worst case scenario for homeowners is finding dry rot in their home, this could potentially result in an intrusive inspection of the property, including replacing timbers and the implementation of a fungicidal spray. 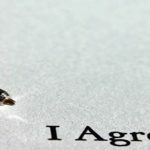 Which in effect, could cost you time and money if not responded to promptly. The good new is, if you’ve found elf cup fungus, don’t panic the repercussions will be far less severe. How Do You Treat Elf Cup Fungus? 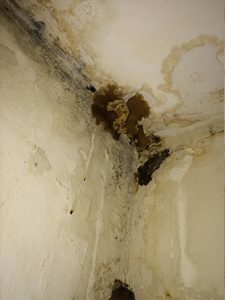 As with dry rot and wet rot, your number one priority is to stop the source of moisture, however, as it is plaster fungus ( non-wood rotting type) there is no need to implement a fungicidal spray. This is completely optional and should only be considered if damp timbers are left in situ. If you are looking to the work out the potential cost implications for your fungal decay issue, give one of our customer service team a call on 0800 288 8660 or simply request a survey.